As part of the planning application for a development land Tyne and Wear Archaeology Service identified the westernmost part of the development area as being the location of South Follingsby Farm. In line with the National Planning Policy Framework and the local unitary development plan, which require investigation of farmsteads shown on the first edition Ordnance Survey mapping Highgrove engaged the services of CFA Archaeology to carry out an archaeological investigation beginning with a programme of trenching across the development area targeting the structures shown on historic maps. Once the preservation of the buildings had been confirmed, an excavation was undertaken to investigate the farmstead further. 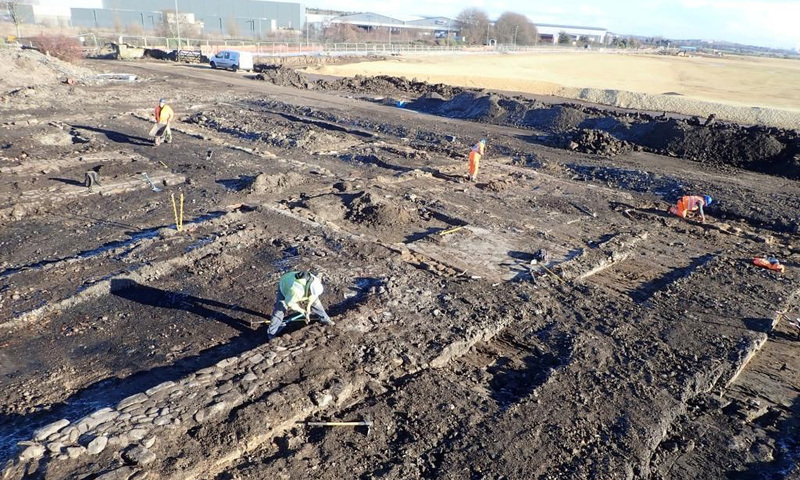 A rectangular area measuring 35 by 55m corresponding to the location of the farm buildings was identified and marked out as the focus for the excavation. 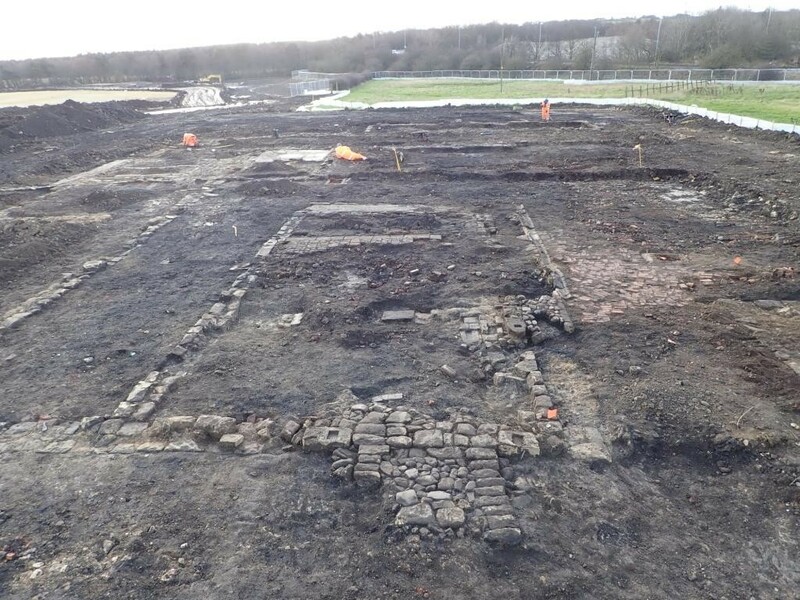 During the stripping it became clear that extensive remains of the farm complex had survived at a level just below the modern ground surface (Image 1, above). Following the careful removal of the bulk of the overburden by mechanical excavator, further clearance work was carried out by hand by team of experienced archaeologists, in order to define the archaeological remains so that the site could be interpreted. Initial indications were that the surviving structures corresponded well with the layout depicted on historic mapping (dated 1857) of the farmstead known at the time as ‘South Follingsby’; a farmstead comprising long ranges of farm buildings arranged in a rectangular plan, around four sides of a central yard. By closely examining the surviving walls and floor surfaces of the farm house, it could be seen that the farm complex had evolved over time, with alterations and extensions being made to the layout. Excavation revealed sash weights and fasteners from the windows and decorated tiles, probably from the kitchen, providing clues as to the appearance of the domestic part of the farmstead. The main barn was also identified, used for the storage and processing of arable crops, with an attached horse‐engine house (also known as a ‘gin‐gang’) which would have housed equipment to drive a threshing machine. The location of this structure was indicated by a black circular mark on the ground; the remnant of the path trodden by the horses (Image 2, below). Horses had long been used to provide power for use in mines, and so in places such as the north of England where the technology of horses harnessed to a rotating shaft was already well known, the combination of this source of power to the threshing machines that were being developed in the late 18th century was rapidly developed. The development of machines to carry out farm tasks such as threshing, previously undertaken by hand, enabled the processing of grain crops to be undertaken in a matter of days, rather than the weeks or months required when the job was carried out manually. While the evidence uncovered indicates that the machinery was originally powered by horses, an extension built alongside the south wall of the barn suggested that animal power was eventually replaced by a stationary steam engine; a more reliable and cheaper alternative to a team of horses. 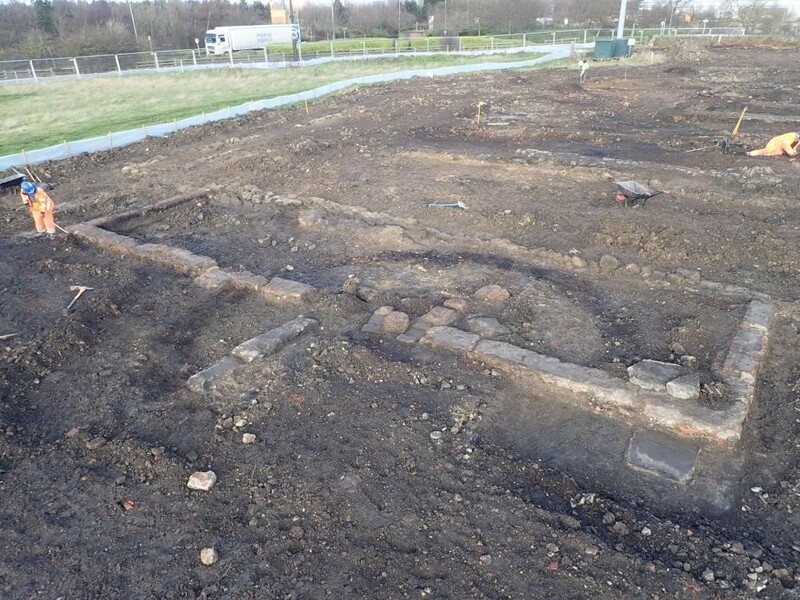 A later rectangular building within the central yard was also identified (Image 3, below). The concrete floors and drains found within this building indicate that it would have provided accommodation for farm animals, most likely cattle, housed in stalls and accessed from the yard by doorways whose threshold blocks could be seen in the side walls of the building. The yard surface itself had been made of compacted sandstone rubble and tightly laid cobbles. The yard was later resurfaced with clinker, no doubt sourced from one of the many local industries producing quantities of this waste material; creating a cheap, hard wearing and free draining surface. Following the completion of excavation work, examination of the findings of the project will continue off site with the analysis of the photographs and detailed written records that were made on site, and further research into the history of the site will be undertaken.